Philip Reeve confirms Shrike is called Shrike and NOT Grike in the movie! You may have read an article we wrote a few weeks ago that considered the name of Shrike from Mortal Engines and why it was changed to Grike for the American publications of the Predator Cities Quartet. We also pondered if the movie production would go with Grike or Shrike. 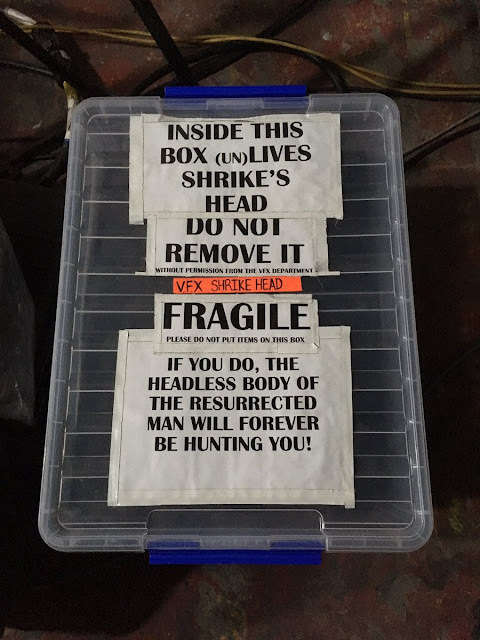 It appears to be the box which Shrike's head is kept in! Which also means Shrike is named Shrike and not Grike! Not word yet on who is playing the green eyed killer! It also means American readers may get horribly confused when they first see the movie as they are quite likely to believe the abomination that Kit Solent became is called Grike with a solid G!